Diesel needs to be part of the energy solution of our country. I know that it is far more fashionable in Washington to discuss plug in electric vehicles but those technologies are years away from broad-scale commercial viability. Clean diesel is here today and can contribute immediately to reducing our dependance on foreign oil, reducing one of the major gasses that cause global warming, give consumers 20-30% better milage and a motor that will last longer! Diesel is a “win-win” for the consumer, the automobile manufacturers and our country. All we need to do is update America’s perception of the technology. 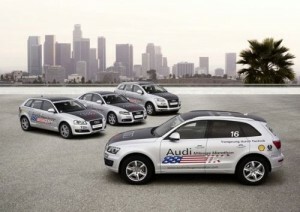 Good for Audi of America for trying to change our perception of diesel. I hope they succeed, that would be good for all of us. This entry was posted on Thursday, July 2nd, 2009 at 1:58 pm	and is filed under Auto manufacturers, Branding, Communications, Strategy, Technology/Product. You can follow any responses to this entry through the RSS 2.0 feed. You can leave a response, or trackback from your own site.